Bernard, H.-U. & Chan, S.-Y. 1997: Animal Papillomaviruses. In: Human Papillomaviruses: A compilation and analysis of nucleic acid and amino acid sequences, (G., Myers, F., Sverdrup, C., Baker, A., McBride, K., Munger, H.-U., Bernard and J., Meissner, eds. ), pp 11-100, III-107. Theoretical Biology and Biophysics, Los Alamos National Laboratory, Los Alamos. Bernard, H.-U., Chan, S.-Y. & Delius, H. 1994: Evolution of papillomaviruses. Curr. Top. Microbiol. Immunol., 186: 34–53. 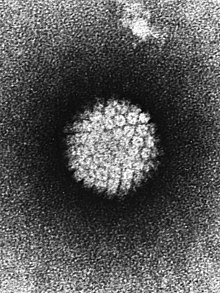 de Villiers, E.-M. 1994: Human pathogenic papillomavirus types: an update. Curr. Top. Microbiol. Immunol., 186: 1–12. Lambert, P.F. 1991: Papillomavirus DNA replication. J. Virol., 65: 3417–3420.